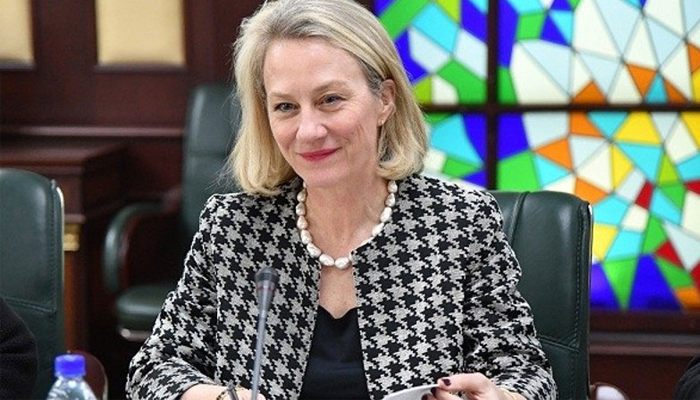 ISLAMABAD: US Principal Deputy Assistant Secretary of State for South and Central Asian Affairs Alice Wells visited Islamabad November 6-7, to review key items on bilateral agenda, including the upcoming Geneva Conference on Afghanistan and joint efforts to advance the Afghan peace process. Ambassador Wells met with Minister of Finance Asad Umar, senior officials from the Ministries of Foreign Affairs and Interior, and Director General Military Operations Nauman Zakria. Ambassador Wells further underscored the importance of all actors in the region taking steps to advance security, stability, and cooperation in South Asia, and welcomed the commitment from Pakistani officials to work towards this goal. Ambassador Wells also discussed opportunities to build business and economic ties between the United States and Pakistan, and explored other areas for growth in the bilateral relationship between the two. On her visit, Ambassador Wells also met think tank representatives, regional security experts, and members of civil society. She highlighted the United States’ commitment to work collaboratively to advance the shared goals of the American and Pakistani people.